The Plandora 1.14.0 version is available. Check release notes here or try Plandora demo version. The Plandora team is pleased to release a Plandora Demo Version for VirtualBox. Since version 1.13.0, Plandora is also available through a Virtual Machine for Oracle Virtual Box. This kind of distribution is helpful to improve the setup procedures or to deploy quickly a demo installation of Plandora. For more information check the Plandora Wiki page. The Plandora 1.13.0 version is available. Check release notes here or try Plandora demo version. Webuzo is a LAMP Stack and a Single User Control Panel specially designed for the CLOUD which helps you deploy Apps on your server, virtual machine or in the cloud. Webuzo enables you to focus more on using applications rather than maintaining them. Webuzo is also available in the form of ready-to-cook Virtual Appliances. "The addition of Plandora into Webuzo library will be useful for Plandora users. The Webuzo scripts reduces considerably the time to setup the tool. In minutes you can get a Plandora instance into a webserver and database. Moreover, the Webuzo Portal will afford to the Plandora Project a very important visibility." says Alberto Pereto, Plandora Project Leader. "Plandora is a wonderful tool in Java to help the software development process and we are happy to have it in our scripts library." said Valerian Pereira, Developer at Softaculous Ltd.
"It will also allow Webuzo users to try a promising Project management script along with the existing scripts in the Webuzo scripts library." Check Plandora reference at Webuzo website here. The Plandora 1.12.0 version is available. 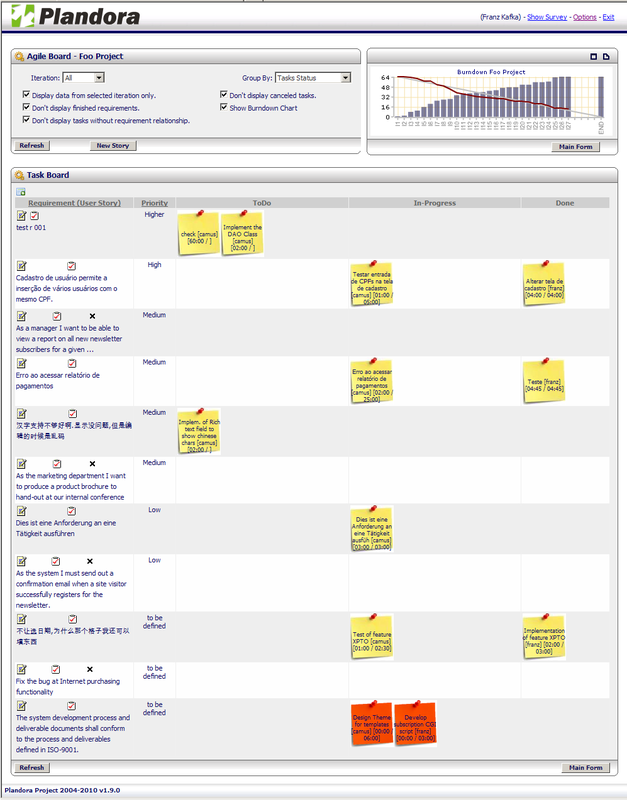 A number of bugs were fixed and new features were implemented such the new Gantt Chart. Check release notes here or try Plandora demo version. The Plandora 1.11.0 version is available. New features were implemented such as My Team grid, improvements at usability and performance and many bugs fixed. Very often we receive feedbacks from people using Plandora around the world or asking about the features or the project roadmap. In this week we receive an email of somebody asking about some specific points. The person was preparing an evaluating study to choose a project management tool that best fit with their business reality. We have noticed that the questionnaire could be used for other people in the same situation, so, we decided to share here. During the last week, the Plandora website was experiencing some instability due to maintenance at our servers. Those issues was affecting this channel and the online demo. Some people made contact warning us about the off-line situation. We want to apologize for the incovenience. The gaps with web site tend to decrease in the next days. Thank you! The Plandora 1.10.4 version is available. Many bugs was fixed in this version. A new Plandora version is available. There are a number of bugs fixed and new features implemented such as Cost Management, Artifact Management (integrated with SVN or local repository) and new Gadgets. Last week, Sourceforge group announced that was target of a directed attack. For this reason, some services were interrupted in order to improve the security issues. One of those issues was about the CVS service that is one of the oldest services of SF. They have mentioned that were considering to discontinuate the CVS support. Because this, the Plandora team has anticipated the plans to migrate the project to Subversion repository. The CVS repository will be available until the SourceForge guys finalize the CVS's end-of-life process. From now, all new features and versions of Plandora will be developed based to SVN repository. A project survey usually originates when an project leader faces doubts about the customer relationship or even if he want to know about the motivation level of team. 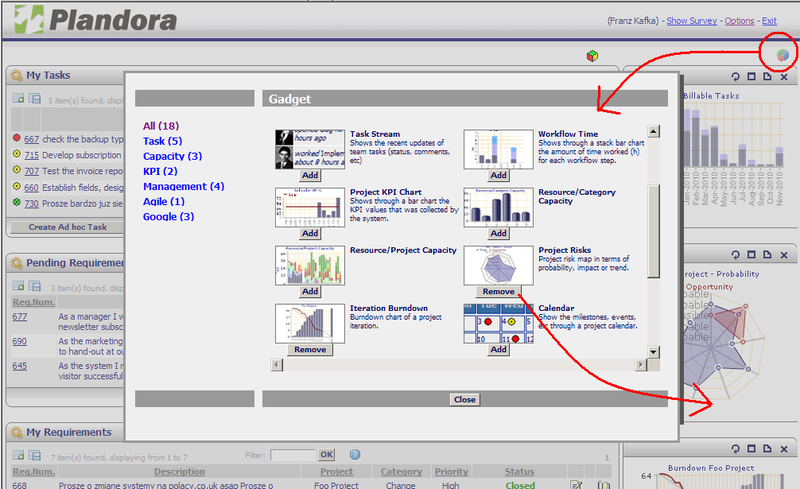 Through the Plandora, the project leader is able to create surveys linked with projects. Each Plandora entity (task, requirement, risk, etc) could contain a relationship with a configuration item of the project repository. This kind of link is very usefull to obtain information such as, which itens of repository were affected by which task or requirement. Since version 1.9.1, Plandora is able to integrate with SVN repositories. A new Plandora version is available. There are a number of bugs fixed and new feature such as Capacity Planning, Project Invoice, Task Workflow, Google Gadgets and a new look'n feel. [update November 13th] The version 1.9.1 was released due to a blocker bug of 1.9.0. The version 1.8.0 of Plandora is available. The main features of this version is the new KPI Form, the Survey Form for the projects and a number of fixed bugs. The Plandora team wants to wish a happy new year for everyone that supports the project in some way. The 2009 was a very important year to Plandora Project. Many features was released and we are planning some news to next month. Thank you! See you in 2010. The version 1.7.0 of Plandora is available. This version contain a number of bugs that was fixed and an implementation of the Agile Board inspired at the Task Board of Scrum model. 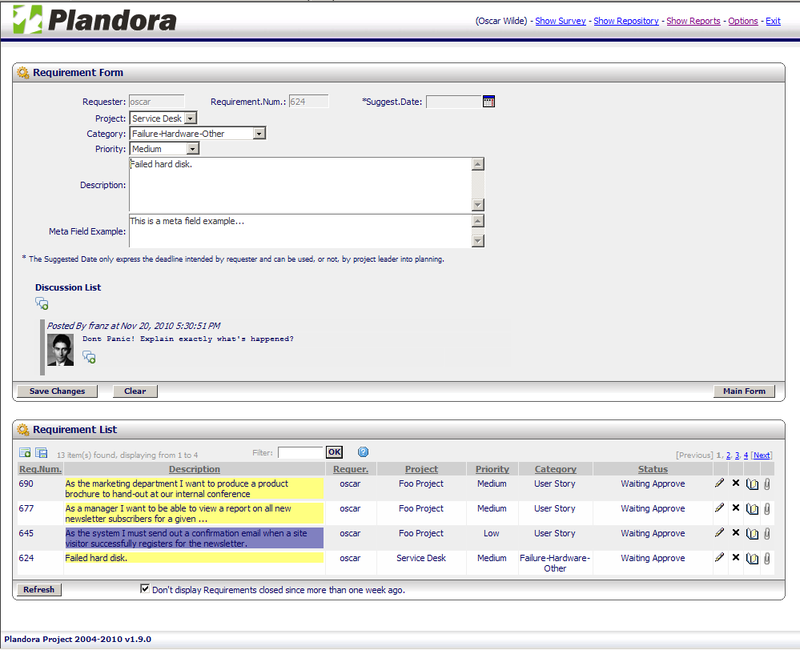 The Plandora developers team wants to listening to the users that are currently using the Plandora tool. We are interested in the motivations, the issues and what kind of improvement, the tool is bringing to the quality and productivity of companies. Click here and fill in our survey! The version 1.6.0 of Plandora is available. This version don't has changes of data base structure in comparison with version 1.5.0, then the upgrade from 1.5.0 is quite simple. 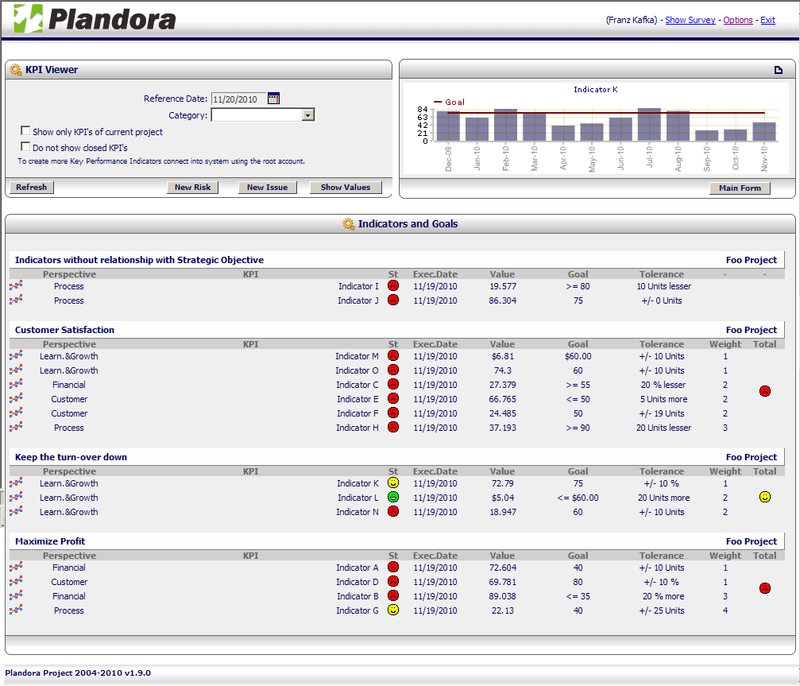 The new version of Plandora is now available. A number of new features was implemented: integration with SVN to allow the file navigation; visual traceability of task, requirements, risks, etc through a 'mind map' chart; inclusion of charts and metrics into main form; new report exportation formats; etc. Due to a bug into sourceForge portal, the installation package it is not available into download into the portal yet. Then, we've put the new deliverable, here. Since the bug is fixed, the download will be able in both sources. At July 7th, the Plandora project was mentioned by Cynthia Harvey at www.itmanagement.earthweb.com. The article described, 101 open source alternatives for enterprise applications. Click here to read. Plandora was selected with other nine applications into 'Project Management' category. About Plandora, Harvey says "(...) In addition to the usual assortment of Gantt charts and resource charts, Plandora also provides a Balanced Scorecard report for tracking key performance indicators (KPIs). (...)"
One week later, the portal linuxplanet.com re-published the same article. Click here to read. The Wiki page of Plandora is now available. The "HowTo's" page that was previously hosted in this website was moved to there. This change was done to make easier the improvement of documentation and contents about the project. A wiki environment is a powerfull communication tool among project developers and visitors. The Plandora Team want to thank the SourceForge that sponsored this new feature. Click here to visit Plandora Wiki Page. Nowadays the agile models of project management are increasingly taking part of analysts reality. Scrum is the one of the most known method to apply the agile method in software projects. An important feature of Scrum is to give to customers the possibility to change the requirements along the project life cycle without the usual impacts that cause pain and discord among the team. The FISL 9.0 has finished. The event has joined more than 7 thousand people from 21 countries. During 3 days has occurred: debates, lectures, changing of information and experiences among user groups, developers and companies. 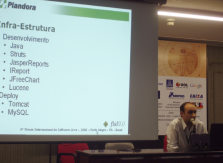 The speech of Plandora Project has occurred in April 19th (it was re-scheduled). During the presentation, the team leader of project, Alberto Paterlini Pereto has made a tour through the tool, showing the main features. Click here to download the presentation (OpenOffice Impress format). Click here, here, here, here or here to see more pictures about the presentation. 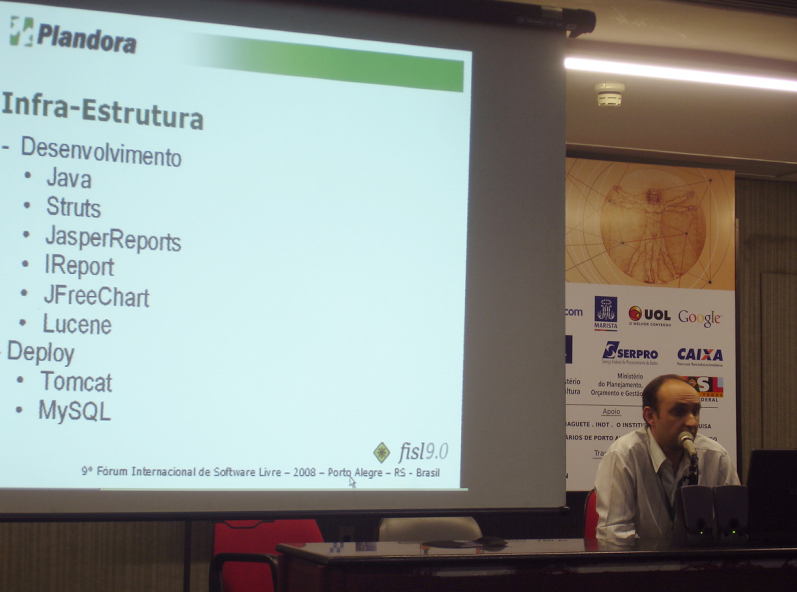 The Plandora Project will be in Porto Alegre - RS - Brazil for FISL 9.0 event. The FISL is an annually international forum about open source technologies and many icons of open source world will take part. The project leader Alberto Paterlini Pereto will present a speaking session during the event (April 17th) which will talk about the Plandora features. Click here to visit the FISL website. The Plandora team are pleased to present a number of demos about the main features of tool. These presentations intend to be a way to support people that are looking for an option for project/ticket management, and are curious to learn more about the available features. Click here to view the presentation topics. How to Reuse the Plandora Gantt in my own Project? The most important goal of an open source project is share with the technical public around the world, source-codes, frameworks or ideas. The Plandora tool was planned and designed to be used partially or fully. One of those "fragments" is the Gantt chart. Click here to see more about this. In the 1990's Dr. Robert Kaplan and David Norton, from Harvard Business School developed a new approach called "balanced scorecard" (BSC). This new approach provides tools to enable the organizations to clarify their vision about the current company situation and to transform the metrics in actions for continuously improvement. Today, many companies are adopting the BSC to monitoring the strategic goals. The BSC suggest four perspectives: "Financial Perspective", "Customer Perspective", "Business Process Perspective" and "Learning and Growth Perspective". 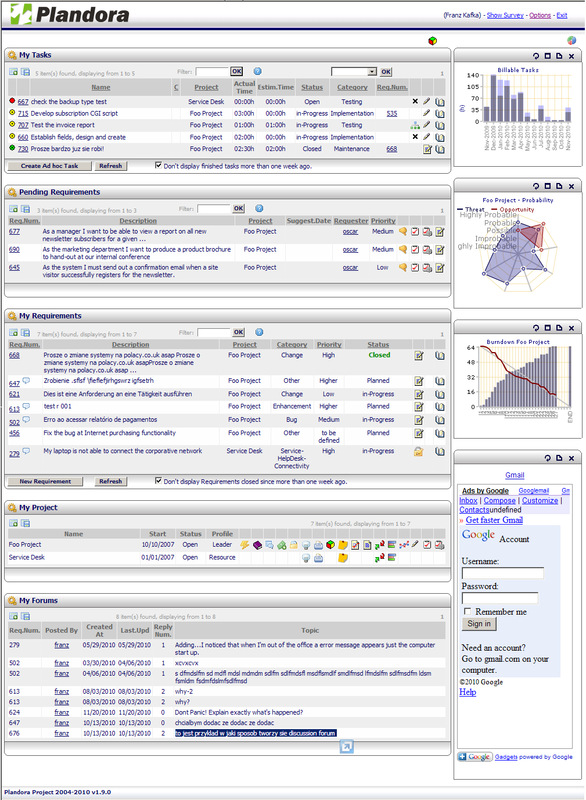 The Plandora enables the project managers or leaders to create and view metrics related to the tool (projects, tasks, requests, resources, etc). Those KPI's (Key Performance Indicator) can supply information to help the stakeholder's strategy for a specific project or even provides information to feed the company BSC. To learn how the Plandora BSC can help your company, click here. To learn more about BSC visit the oficial site about it or the wikipedia references. Nowadays, the companies demand systems that are able to supply features for specific purposes. In workflow tools, is important to create screens that collect as maximum as possible information from the customer (requirement, tasks, etc) in order to improve a data base with information about the project's history and the company's knowledge. Plandora, since version 0.9.1 implements the approach of Meta Fields to address this issue. Meta Fields are dynamic GUI resources generated and configured to display into the forms any information with customized appearance. 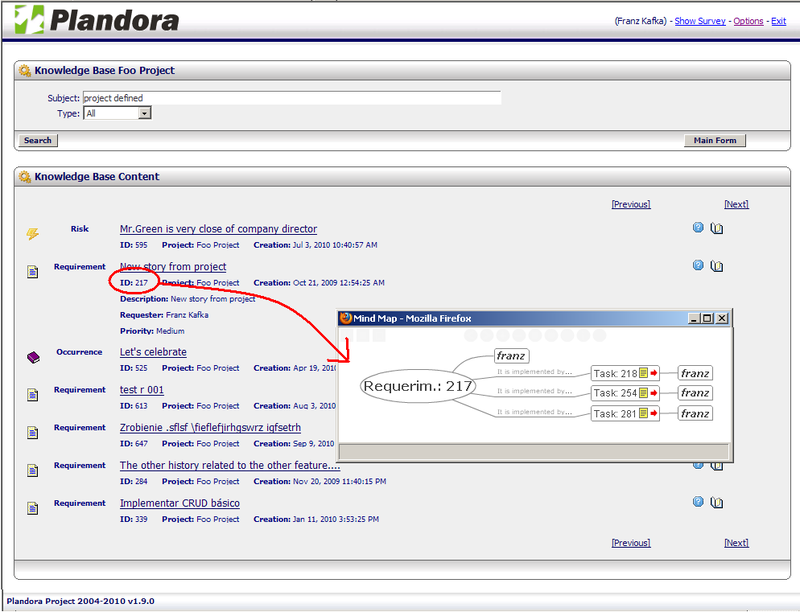 For more information of how to create a meta field in your Plandora's project, see the link here. We are very glad to present the new Plandora web site. This new site is part of the efforts to change the project look'n'feel. We introduced the new Plandora logo, a new color style and the content of web site in English idiom (this project was originally conceived in Brazilian Portuguese). Our purpose is to improve a communication channel with the development community and the system users. Besides, at this month (July,2006) we complete two years since the first version of system was released, and all this period more than one thousands of downloads was performed. For this reason, we believe that there are an enormous public looking forward for good workflow tools, and Plandora wants to be one of those tools, with the advantage to be open-source and royalty-free.. The next steps are to open an area for FAQs about the system usages and a specific area to support the developers that eventually wants to help us.